what makes the burg go round: LOVEworks. | i love my burg. what makes the burg go round: LOVEworks. On Saturday, April 13, the kids and I made our usual trip to Shank’s Bakery and the Farmers Market when we spotted our friend Nicole in the back yard of the Arts Council building. And then we remembered it was a special day! It was the day to unveil LOVEworks! Before she and other officiants cut the ribbon, she filled in the gathering crowd on the unique project. 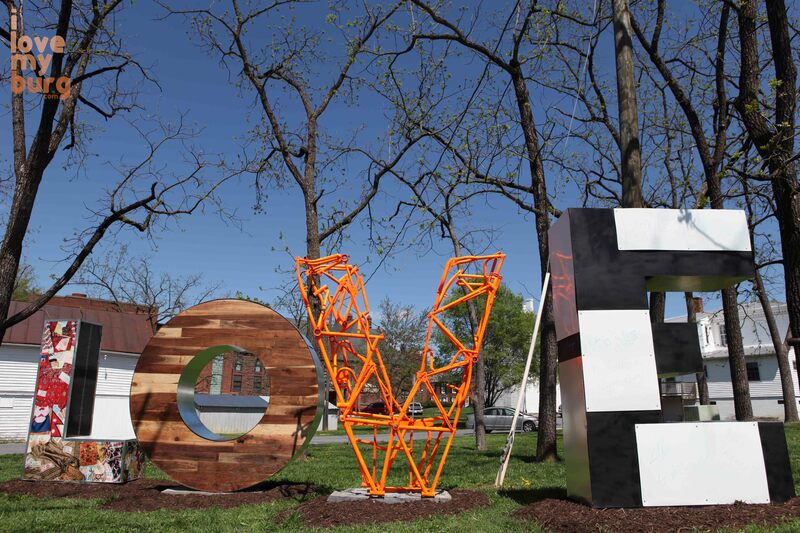 LOVEworks is a program by the Virginia Tourism Corporation that seeks to promote the message that “love is at the heart of every Virginia vacation.” Harrisonburg makes the twenty-first city in Virginia to create and display a LOVEworks sculpture. You can see pictures of the other twenty sculptures at the Virginia Is For Lovers site. Harrisonburg artists Nicole Martorana (yes, she wears a lot of hats), Jeff Guinn, and Mike Herr designed our love letters, each six feet tall and spanning a total of sixteen feet. The L represents Harrisonburg’s cultural diversity and is covered with a photographic collage of local residents’ belongings from their native countries. The O is wooden, representing agriculture, with a planter built into the top (holding strawberries, sedums, and other native plants) and metal sides that will rust over time. 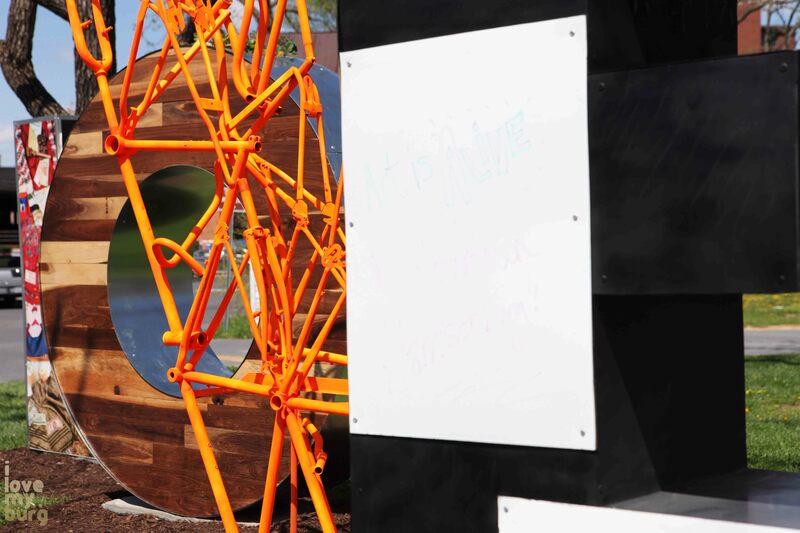 The V is made of bicycle parts and spray-painted blaze orange to symbolize our cycling, hunting, and fishing friends. 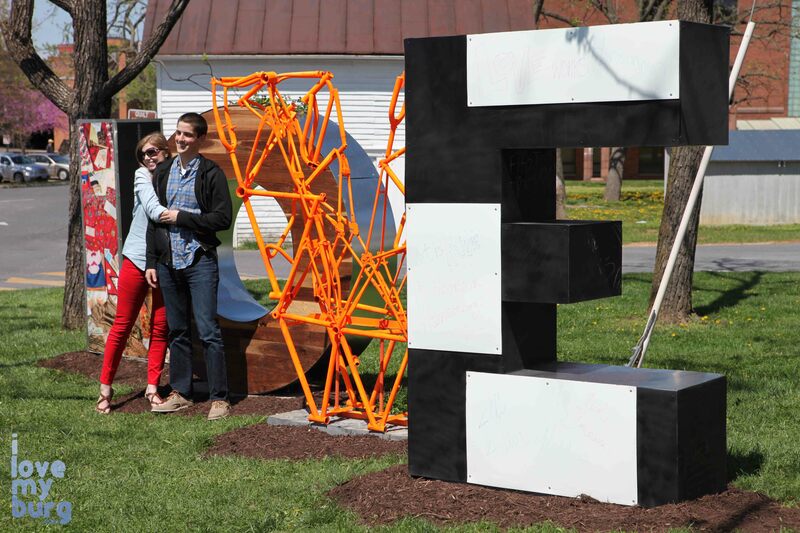 And the E is a combination of magnetic dry erase and chalk board designed to be an interactive symbol of Harrisonburg’s love of art. In fact, it can be used as another exhibit location on the First Fridays art walk. And then, the giant scissors snapped and LOVE became an official fixture downtown. This entry was posted in events, kids and tagged agriculture, art, Brandy Somers, culture, cycling, Harrisonburg Farmer's Market, Harrisonburg Virginia, Jeff Guinn, Katie Mitchell, love, LOVEworks, Mike Herr, Nicole Martorana, sculpture, Shank's Bakery, Virginia Is For Lovers by junebug. Bookmark the permalink.